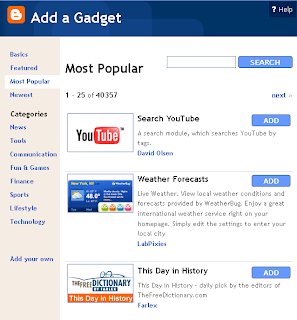 Blogger Buster: A New Interface for Blogger Widgets Gadgets! 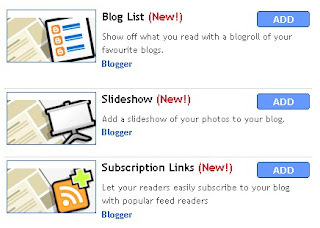 Blogger in Draft now features a whole new interface for adding widgets (or should I say "gadgets") to your blog layout. When using Blogger in Draft to edit your blog layout, you will notice that "Add a new page element" has been replaced with "Add a gadget". The pop-up screen has been completely redesigned, featuring all available Google Gadgets (organized by category) as well as the "Basic" Blogger widgets we are all used to using. The design of this "gadget" interface has been given a makeover, allowing you to understand your choice of widgets at a glance. Furthermore, Blogger have added a useful search function so you can find the perfect gadget from the vast array available. If you want to check out the new Blogger Gadgets interface for yourself, log in to your blog through Blogger in Draft and take a look at your Layout page. I haven't (yet) found any bugs or glitches with the new scheme of organization and hope this will be released for general use soon enough. It is certainly an improvement of the existing method of adding widgets to our blogs! Please do let me know what you think of this new interface by leaving your comments and opinions below.